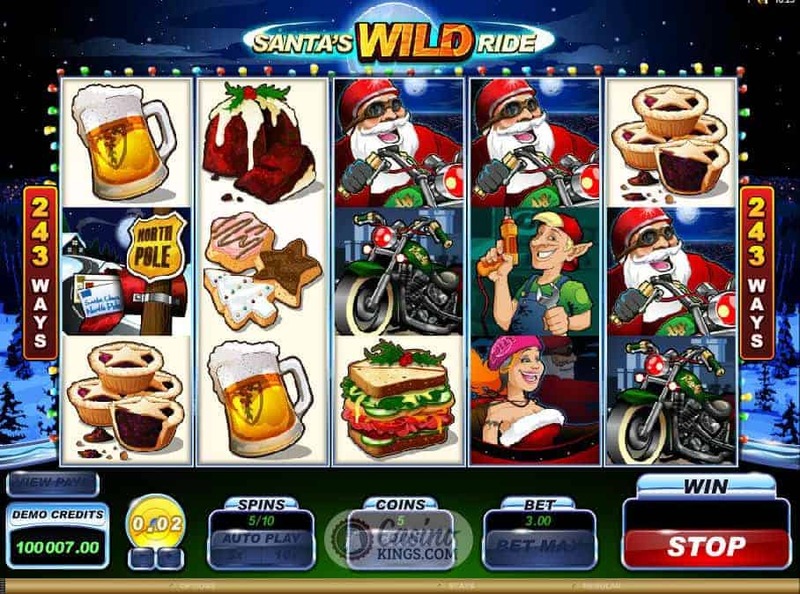 I’ve just finished playing the Santa’s wild ride slot game and I’ve often thought that Santa would be a bit wild deep down. Nobody that good and nice all the time couldn’t go the whole of the rest of the year without letting his hair down. All that time off work would give you plenty of opportunity to go at least a little bit crazy. 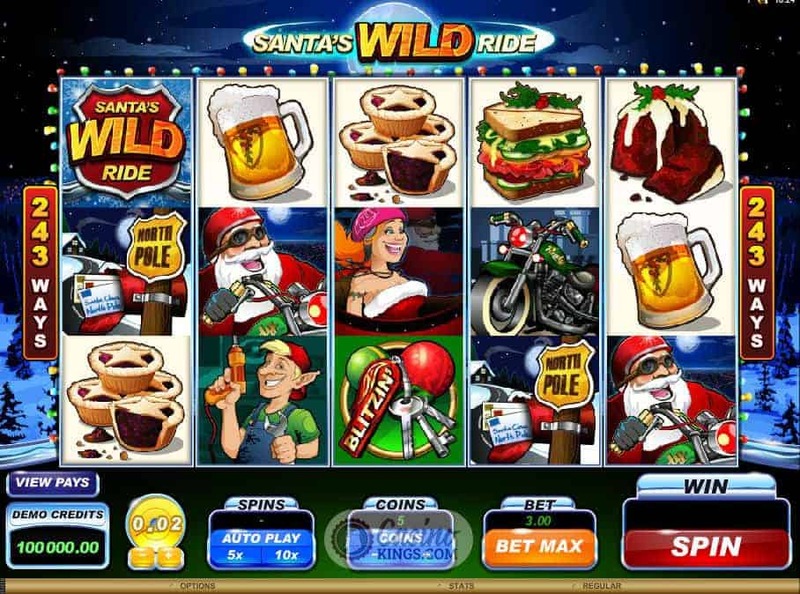 That’s what Santa does in this wild online slot from Microgaming. And then some. Hold on to your Christmas hats – Santa is going bye bye! So just how wild is this ride going to be for Santa? Santa and Mrs. Claus are going crazy on the back of Santa’s Harley with some hilarious symbols that grace these five reels. It looks like Santa has “Randy” painted on his bike too…I wasn’t sure it was going to be that kind of a ride! To be fair Mrs. Claus looks like she is bang up for it. And who knew she had a tattoo? 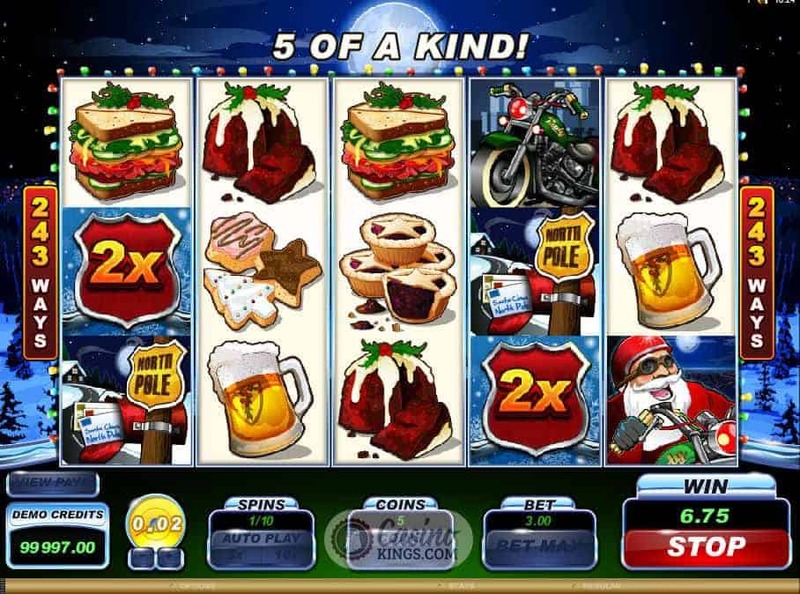 They spin away to a rocking Christmas tune as we go in search of wins across Microgaming’s trademark 243 Ways win structure. 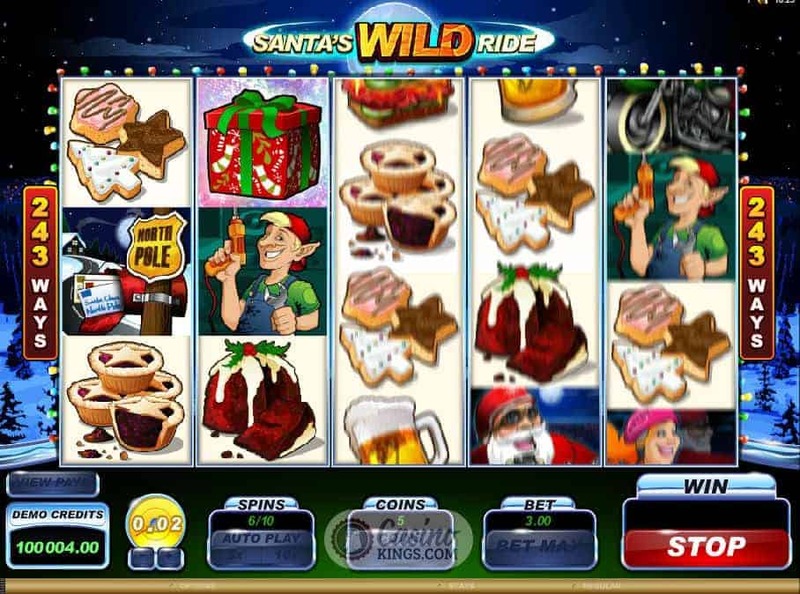 And the Wilds in this wild slot? Why, the game logo of course! But complete a winning way with one of these Wilds and we will receive a random multiplier – either 2x, 3x or 4x. And if those tasty wild presents weren’t sweet enough, look out for Santa’s surprise Free Gift Bonuses that appear at random on reels 2 and 4. We’re going to need a bigger boat for all these presents! Our aim for the bonus round is to land three or more motorbike key Blitzin’ Scatters, which launches the bonus game that will see us bag 25 Free Spins. However, Santa’s Elves have a cheeky present for us. Three of these impish gift grantors offer us three different kinds of Wilds during the 25 Free Spins, and unlike most gifts at Christmas the choice is actually ours and we won’t be enquiring after the receipt. We can choose either Stacked Wilds, Expanding Wilds or Trailing Wilds, and if you want to know the difference between the two you’ve got two options: either you can look it up in the pay table or play the game until you’ve sampled all three. Guess which one’s more fun? And just as fun are the helpful truisms that Santa shouts throughout the Free Spins feature, like, “Everyone Wins Big at Christmas time!” True dat, fat man. True dat. So Santa really is going on a Wild Ride, although judging from what’s painted on his bike it should be Mrs. Claus that goes on a Wild Ride. Anyway, the upshot for us is twofold: first, we don’t have to watch what happens when it’s time for the riding to commence; second, we get to play an immensely playable and entertaining online slot that has an impish bonus game to boot. Now that’s what I call Christmas!